On one of the darkest days of the year, a few small candles were illuminated, marking a festival of light and a celebration of community. About 135 people attended the Wood River Jewish Community's Hanukkah party and community potluck Thursday at Our Lady of the Snows Catholic Church. 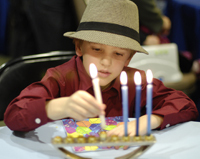 Hanukkah, the Jewish Festival of Lights, is celebrated this year from Dec. 20 through Dec. 28. "We're here together as family, and that's very special," said student Rabbi Daniel Utley. Though not one of the Jewish high holy days, Hanukkah is celebrated as a time for gathering around friends and family, honoring tradition, giving thanks, doing good works and celebrating. Blessings, songs and feasting are part of the holiday. Hanukkah history dates to 160 B.C., when Antiochus IV, a Syrian-Greek king, began waves of persecution against Jews. Revolting against oppression, Jews, led by the Maccabees, defeated the king's armies and liberated the Holy Temple in Jerusalem. The Holy Temple must have a continuously burning candle, Utley said. As Jews sought to purify and rededicate the temple, they realized there was enough oil to last only for one day. A candle was lit, and, according to tradition, with only the small amount of oil, it burned for eight days. "So, we celebrate the eight days," Utley said. The celebration has taken on additional meaning today, he added. "It's come to stand for concepts of freedom and light," he said. Utley said it's a time to engage in social and charitable causes, "to spread light where there isn't any." The religious aspect of Hanukkah is the ceremonial lighting of candles. For Hanukkah, a special menorah-like candelabrum called a Hanukiah is used. A Hanukiah has nine branches: one for a leader candle, the shamash, and eight branches, one for each night of the festival. For Utley's wife, Rachel, that ceremony is her favorite part of the holiday. "I love lighting the menorah," she said. "It's a really beautiful tradition. It's got a lot of meaning." The theme of oil is incorporated into Hanukkah through food, Utley said. Jelly doughnuts, potato pancakes fried in oil and other specialties are reminders of oil's significance to the holiday. Reginald Reeves, of Sun Valley, said the holiday for him means volunteering time with kids. "It means on Saturday I'll do storytelling for all the children," he said. That day, he'll read Hanukkah stories to kids at the Community Library in Ketchum, part of his annual tradition. Later, he'll read children's Christmas stories. Before dinner began Thursday, Hailey resident Molly Kucher, 10, sat at a table with several other kids, playing dreidel, a traditional Hanukkah game. She was another festival-goer who said the lighting of the menorah was one of her favorite parts of the holiday. "It's just really fun to do, lighting the candles," she said. She also admitted to loving ruglah, a flaky rolled pastry. Claudie Goldstein, executive director of the Wood River Jewish Community, said she was glad to see so many people, especially children. The community is supported by locals as well as a large percentage of part-time residents and frequent visitors, she said. "For the Jewish community, it's very important to maintain a presence in the valley," she said. "That is our priority." The event also included a silent auction, funds from which will be used to send children of the congregation to a history exhibit, "From Haven to Home: 350 Years of Jewish Life in America," in Caldwell, 30 miles west of Boise. The exhibit, hosted by College of Idaho, is a newly designed version of an exhibition at the Library of Congress. It runs from Jan. 9 through March 19 at the College of Idaho campus.